What are the implications and what can we do? You may have heard in the land of SEO that there are plans to encrypt all organic searches via Google – by Google themselves. It became evident in October that there are plans to further roll out secure search and inevitably make it default for all Google searchers. As a result, Google Analytics will continue show an increase in (not provided) search queries in the coming months, however this will not apply to PPC advertising. With the gradual increase in the (not provided) guise, we are seeing that this is overtaking meaning that we could be missing important keywords when compiling data. One would ask is this as sudden as it seems or has it been a gradual change? Back in October 2011, Google decided to encrypt searches for people who were signed in to their platform (i.e. Gmail, Google+ etc.). The company had stated that it wanted to eliminate the possibility of eavesdroppers and spies, who would potentially be monitoring a whole sequence of search queries made by an individual. In addition, publishers in turn were restricted from seeing these keywords as they may have been too ‘private’ to unveil. Whilst the best interests of the searchers are in mind, sadly it’s not an ideal situation for those who are trying to examine what keywords are driving the most lucrative traffic to their sites. Adding SSL encryption to signed in searches suggests that Google had previously aimed to protect only it’s loyal users, however the recent decision appears to now be targeting those who aren’t signed in. It is widely established that the change is sudden, the volume of (not provided) search terms have grown over the period of recent years. Whether this has been an automated alteration, or if Google has decided to flip an impromptu switch, it is unclear. 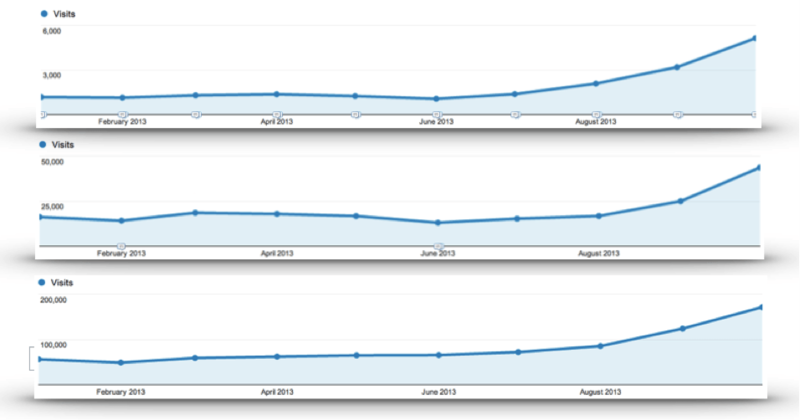 The above graphs show prime examples of the sudden growth in (not provided) terms month-on-month. These particular Analytics profiles’ date ranges were set from the 1st January 2013 until the 31st October 2013. This is something current Analytics users will definitely have seen across numerous accounts; the imminent completion of this trend would be a logical conclusion. Notprovidedcount.com has revealed that over 78% of searches are now hidden as (not provided) results. Arguably as sudden as it seems, this eventuality may have been in the pipeline for some time. So what does this mean to us as search marketers? In light of the recent news that Google is extending this ideal to include everyone, search marketers everywhere let out a gasp. Already we are seeing a growing number of (not provided) results, amongst the cacophony of keywords we sift through on a daily basis. Surely hiding these terms might cause disruption to common practices and reporting on progress over time? The answer is ‘yes’ there will be an impact when reporting on keyword volumes either month-on-month or year-on-year. Similarly, this presents problems when trying to provide comparative reports over time for brand versus non-branded traffic. It is important to remember that these individual keywords will all eventually be completely masked by the (not provided) label. As a rule in SEO, PPC and search engine algorithms, keywords play a vital part of how we shape and implement content. They are essential in helping to determine how the web is built and experienced. Ultimately, this is how the web experience is improved! The question is, if organic search terms are hidden within Analytics, how are we supposed to see what keywords are driving natural traffic to the landing pages and result in goal conversions? It can be said some search marketers have simply fallen into a mind set where this data was so easily accessible they neglected the potential of new ideas and the complex nature of how the search engine assess the relevance of a page. With recent algorithm updates, such as Hummingbird, Google are placing an emphasis on better serving ever more complex search queries with a view to the expected increase in voice search. This may in fact be a positive step forcing the arm of some marketers to stop laser focusing on specific keywords, instead trying to better serve a visitor’s UX by providing the very best and most informative content. Although we have lost a useful tool we still have lots of options left with which to create valuable insights and reports. As a saving grace, Google Analytics allows us to see landing pages that search traffic has been directed to. From this you can have an idea of the kind of terms you already have on those pages, and determine what queries are likely to drive that traffic. These pages would probably have been optimised for core keywords, so in terms of reporting you will still have a reasonably clear idea of what kind of terms drove this traffic. The next step to this would be to compare your findings to keyword rankings in order to gain a more refined understanding of where you are appearing in SERPs for those terms. Again it is important marketers don’t regress to obsessively monitoring positions on what they consider to be head keyword terms. Ultimately this will not help them develop the type of content that helps to support a visitor’s overall experience when they visit a site. It is undoubtedly going to require something of a mind shift towards analysing aggregate data for specific landing pages. Of course it doesn’t really matter which terms are driving traffic if traffic volumes continue to increase and conversion rate is strong. 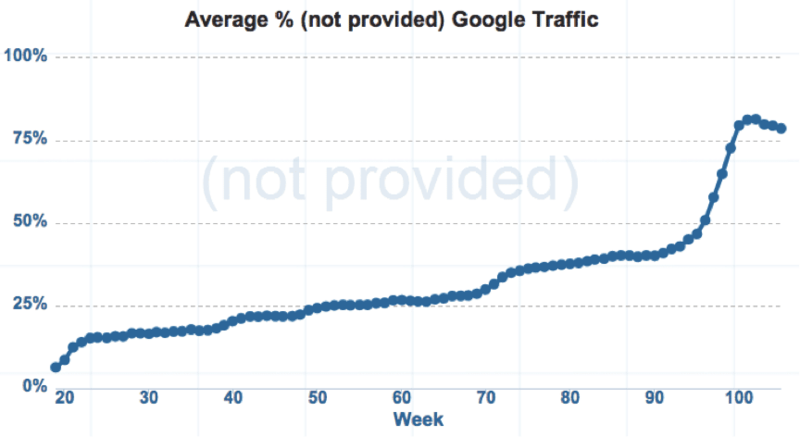 The process of conversion rate optimisation may initially appear to be impacted by a loss of available data. However, so long as clear tests are implemented on landing pages and conversion rate is measured for these pages it shouldn’t be impossible to continue driving conversion rate optimisation forward. This will then leave you with a decision to say whether the traffic gained to a particular page is justified, dependent on overall traffic numbers, conversion rate, user engagement and, of course, rankings. Google’s Webmaster Tools and AdWords interfaces will continue to provide valuable search query data, so all is not lost. When looking for new content ideas these tools can be particularly useful. However, it will also be possible to use historical data to identify terms that have either poor engagement or conversion rates. If there is no content that clearly serves these search queries, new content may be desirable. Similarly it will be possible to evaluate keyword positions and their associated pages. Terms that appear to be on the cusp of ranking well (sitting around page 2) may deserve further attention to look at the relationship between the selected keyword and the on-page content. If the relationship is poor, new content may lead to improved rankings and ultimately additional targeted traffic. Again, it will be vital that marketers don’t become obsessed with creating a single landing page per desirable keyword term. This can lead to large volumes of low quality content. If this cookie cutter approach is taken, results will probably be disappointing anyway. Any new content created should always balance desired outcomes with what will actually be of use to the visitor once they visit the site. In conclusion there are numerous ways to deal with the (not provided) issue. Many, however, would not see it as an “issue”, more an opportunity to improve their SEO skills. For more insight and interesting takes on the (not provided) fun, cast your eye below.